The Bryant-Bannister Tree Ring Building on the University of Arizona campus was built to LEED Silver standards and houses the Laboratory of Tree-Ring Research, which had been in temporary accommodation under the west side of the Arizona Stadium for more than 70 years. Lang Wyatt Construction was the general contractor for 17,300 square feet of new space. PJD completed heavy and light gauge framing, gypsum installation﻿ and finishing, as well as the suspended acoustic tile ceiling. The 10-m﻿onth project was partially constructed during the school year, which required extra safety precautions for students attending class in the immediate area. Developed as a public private partnership by American Campus Communities, the Verde Dining Pavilion is ASU West’s only dining facility on campus for students, and it was built in conjunction with the Casa de Oro on-campus student housing project. hardison/downey served as general contractor for this project. PJD crews, which peaked at about 50 professionals, worked for four months in 2012 on this project completing general drywall. 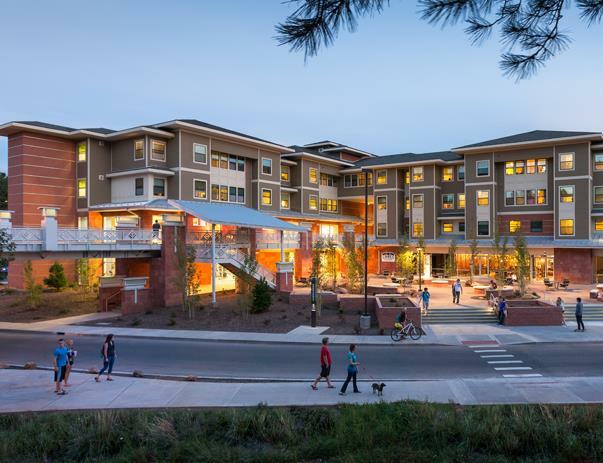 Developed by American Campus Communities, The Suites offer 275 fully furnished one-bedroom and two-bedroom student suites in two four-story-plus-plaza level wood-frame dormitory buildings. The 12,140-square-foot community center -- included on the first floor of one of the buildings -- features a fitness center, theater, social lounge, business center and plaza with 4,365 square feet of retail space. hardison/downey served as the general contractor.